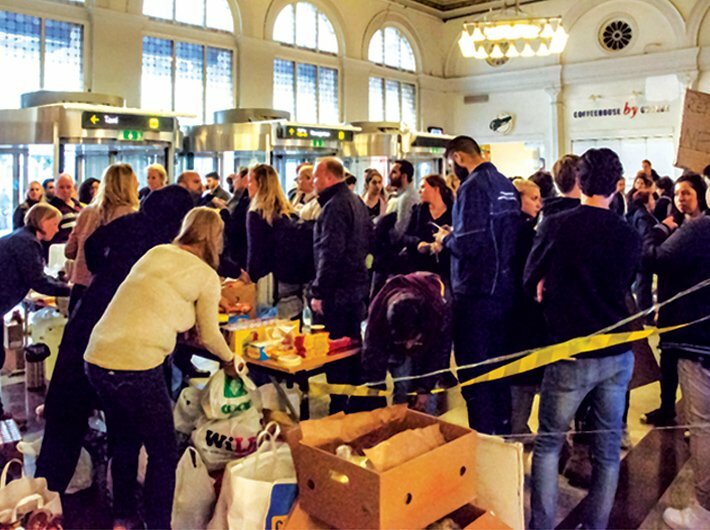 Refugees from Syria at Stockholm Central Station by train through Denmark and Malmo in September 2015. The three-storied brick house stands nondescript against a soggy brown landscape. A typical Skåne construction, it has nothing to set it apart in its description except for its residents. The residents are anomalies in the outskirts of this tiny southern Swedish village called Klagstorp. Having endured perilous journeys half way across the world they are thrown in together like mismatched clothing in this building which is an hour’s drive from Sweden’s third largest city, Malmö. We ascend the stairs with a strong smell of spices wafting through the air and invading our senses. We knock on the door and much to our surprise, and delight, a chirpy-looking young man opens the door and speaks in fluent Swedish. Maria, a former Swedish journalist, explains that we would like to talk to them to which they agree. As we enter the yellow-walled apartment, an older and depressed-looking man comes out of a room and sits with us. Reza (name changed) is a Palestinian from the besieged Gaza Strip. He is around 35 years old. He came by boat to Italy and trudged his way up to southern Sweden. That was four years back. He is waiting for his papers that will allow him to work in Sweden. He receives 70 Swedish krona from the government every day. To put matters in perspective, a bus ride to the local train station costs about 50 krona. “I haven’t left the apartment in a month. What else to do? They don’t even tell me when I am going to get the papers.” Reza was a civil engineer at home in Gaza but he is “gradually forgetting everything”, he adds in broken English. His wife and two children are back home. Why doesn’t he go back, I ask. “How?” he retorts, “Egypt closed its borders with us and so did Jordan and Israel.” His life bears scary similarities with the Steven Spielberg-directed blockbuster, The Terminal, in which Tom Hanks, trapped in the JFK international airport, is denied entry into the US and is unable to go back home because of a revolution there. “There they kill us with guns and mortars and here they kill us slowly. I curse the day I came here,” Reza says with downcast eyes. In stark contrast to Reza are two young boys from Herat in Afghanistan – one, listening to our conversation with a smile that never seems to leave his face and the other, cooking something enthusiastically. The boys claim to be 18 but look at least 21. They receive 153 Swedish krona each and attend a Swedish language school. They are in the building for 10 months now and already have their papers in place. The boys lived in Iran for two years before coming to Sweden. Though Herat is a relatively peaceful region in Afghanistan, the Swedish government favours persons below 18 years of age in granting asylum and even sends them to state-funded language school to help integration. One of the boys scribbles a sentence in Swedish and looks for approval towards my companion. Reza looks on at the boys, almost accusingly. “Very good,” she exclaims. She later tells me that there was a minor grammatical mistake in the sentence. Two men, one young and the other much older, emerge from another room. It turns out that they are father and son from the war-torn Aleppo. The older, slightly gruff looking but soft-spoken man is Ahmad, and his French-beard-sporting young son is Mohsin (both names changed). They speak only Arabic and, hence, Reza has to translate for us. Ahmad lived in a refugee camp in Aleppo, originally coming from Palestine, with two other sons and a wife. The huge refugee camp lay half on the Syrian government side and the other on the ISIS-held territory, consequently, getting bombarded by all the warring sides – the government, the international coalition and the terrorist group ISIS, also known as ISIL and IS. Ahmad tells Reza that they came by boat to Greece. The ‘captain’ of the boat lost his way and they ended up spending 10 days on sea. Ahmad paid US$ 6,000 per person to the human smugglers, crossing Germany and Denmark, to finally reach Sweden. He was forced to make the difficult choice of deciding which one of the sons was to make the journey with him to Europe. He left the rest of the family behind with his mother-in-law. “I just couldn’t pay for all of us,” he tells us. Ahmad and Mohsin get paid 60 krona each being considered a family by the Swedish migration authority, Migrationsverket. They are waiting for their papers in this red building. Sweden is the largest home to Syrian refugees outside of the Middle East – it had about 1,90,000 arrivals in 2015 and expects the same number next year. Sweden and Germany (which has 1 million registered asylum seekers in 2015) have been the most generous countries towards asylum seekers in Europe in the face of this mass movement of people towards the global North. At the peak of the Syria crisis and again in November about 2,000 people came in through the Øresund bridge every day into Malmö which is a 40-minute train ride away from Copenhagen. Two days prior to the Paris attacks of November 13, however, Sweden re-established border control at the first station of Hyllie. Less than two weeks later the Swedish government, additionally, announced that it could not provide accommodation to the asylum seekers and was shutting the doors to any more permanent refugee settlement – from April 2016, the Nordic country will only offer temporary residence permits barring unaccompanied children and single women. “We have entered a new phase in which the Swedish Migration Agency is not able to offer shelter to everyone. There are not enough places,” the agency’s director of operations Mikael Ribbenvik said on November 26 in a press statement. This led many commentators to state that the last bastion of humanity in Europe has fallen. For years Sweden has taken more refugees per person than any other country in Europe. However, its domestic politics, as in other parts of Europe, is radically changing with a far-right party called Sweden Democrat (SD), with acknowledged neo-Nazi roots, fast gaining importance and negatively influencing the intake of any more refugees (see below). Apart from electoral compulsions in Sweden, there are inherent fault lines in absorbing asylum seekers, and absorbing fast those who are already in the country. One of the biggest obstacles is the time that Europe, in general, takes to grant asylum seekers the status of refugees, sometimes making them wait for years. During this time the asylum seeker typically gets shelter and some welfare benefits but is not legally allowed to work and is barred even from enrolling into state-funded language lessons. An asylum seeker may, however, apply for an exemption for a work permit called AT-UND in Sweden only if s/he has a valid ID and a “well-founded” reason. This year, 374 Afghans, 1,643 Eritreans, 1,502 Iraqis, 720 Ukrainians, and 13,282 Syrians, among others, have been granted AT-UND. This is, however, a miniscule number compared to the total number of asylum seekers who are waiting for their papers. The other obstacle is the time it takes to assess the skills and education of the new arrivals – about 11 months. “You see, it is terribly hard to get into the labour market of our country,” said a Swedish diplomat during an informal conversation about refugees. “Another thing is that we don’t discriminate between asylum seekers, choosing only the educated and physically fit ones like other countries. We just go by vulnerability,” the diplomat added. Sweden is a strong welfare state where once you get into the system you are entitled to a range of benefits. The average time it takes for an educated newcomer to find a job is about six years. However, Swedish labour agency has plans to cut down this time to between one and two years. It has chosen about 20 occupations where this could happen. It has, for instance, identified about 1,800 refugees who will be put on a fast-track programme from January to teach in schools, especially ones where the refugee children are in large numbers. Though Stockholm is scrambling hard to achieve a tough balance between domestic politics, economic compulsions and the rush of extremely vulnerable individuals, the system has already started creaking loudly. The influx of people has seen economic migrants, climate and environmental refugees, internally displaced persons, trafficked men, women, and children, and escapees of war and violence come along with asylum seekers (people fleeing persecution and conflict). The right of non-refoulement, which necessitates asylum seekers not be returned to their homeland while a threat persists, lends a much greater chance of asylum to any Syrian who lands on the Swedish soil. The rest of the migrants and asylum seekers, therefore, are exposed to a much greater shot of randomness in being granted a refugee status than what is already inherent in an administrative decision. Thus, Reza has the misfortune of coming from the “wrong” war zone. Though Gaza may be almost as ravaged as Syria, it does not figure high enough in the vulnerability hierarchy. “Reza may have had his application rejected and he may have appealed against the decision because of which the process has taken four years,” says a Swedish migration officer. Typically, it should take seven months, she says. Similarly, though the Chadians, Nigerians, Iraqis from peaceful regions, Eritreans, and Somalis may be escaping crushing poverty, everyday violence and brutal regimes, they have a much slimmer chance of getting their applications approved. In 2014, the Organization for Economic Cooperation and Development (OECD) warned that Europe’s working-age population is set to decline by 7.5 million between 2013 and 2020. Europe is in dire need of skilled workers. Germany alone has a shortage of 1,73,000 in MINT (mathematics, IT, natural sciences and technical subjects) jobs which could quadruple by 2020 if the situation is not addressed, the Economist reports. Sweden lists about 80 trades with a huge shortage of skilled workers. Young Swedes are moving away fast from the service industry even though the hotel business is thriving leading to a huge dearth of chefs, waiters, porters, etc. There is much space in the middle and lower ends of the job spectrum. Against this backdrop, the incoming mass is much younger than the greying population of the host countries – Eurostat, the EU’s statistic agency, reported that 82 percent of the 7,29,000 asylum seekers registered between May and October were younger than 34 years. In a first-of-its kind survey that the UN refugee agency UNHCR conducted in December among asylum seekers who arrived in Greece between April and September, it was reported that 86 percent had a high level of education, at the secondary or university level. “The largest groups were students and working professionals, including teachers, lawyers, doctors, bakers, designers, hairdressers and IT specialists. It’s the whole fabric of society that is fleeing,” said Melissa Fleming, spokesperson for the UNHCR, in a news briefing. However, notwithstanding the major unintended benefits that might accrue from this migration crisis, there is increasing and tangible popular resentment against the new arrivals. The migration issue which follows closely on the heels of the eurozone crisis has given a fresh lease of life to rabid right-wingers across the continent. The far-right Sweden Democrat (SD) party which drew just 2.9 percent of the votes in the 2006 elections won 13 percent of the votes in the 2014 elections and with recent opinion polls give the neo-Nazi party more than 20 percent of the vote share, making it a major political force. In France, the far-right but marginal party of Marine Le Pen, National Front (FN), drew a whopping 28 percent in the regional elections, gaining strength during the eurozone crisis and reaching a peak acceptance during the migration crisis. Hungary has been at the forefront of anti-migrant propaganda with prime minister Viktor Orbán raising a 41-km barbed fence along the country’s southern borders. Paid advertisements have appeared in papers which say “the migrants threaten our culture”. Bulgarian soldiers are allegedly robbing and physically abusing migrants who are trying to cross over from Turkey even when Bulgaria has also raised a fence to keep out migrants from entering their country. In Poland, voters have thrown out a centrist government in favour of a nationalist and religious party called the Law and Justice (PiS) party. In Germany, a new right-wing party called Alternative für Deutschland (AfD) was established in 2013. In Italy new political opportunities have been created for the anti-immigrant party, Northern League, which under the leadership of Matteo Salvini has drawn 16 percent of the votes in recent polls. These nationalist parties feeding off xenophobic populism and fears have found a renewed and dangerous raison d’etre – shuttling between the vicious space created by anti-euro, anti-Islam and anti-immigrant rhetoric and mixed with anti-left economic policies and cultural conservatism – threatening to undo the European project altogether. The OECD estimates that in the case of zero net migration the shortage of skilled labour in Europe will be as high as 11.7 million people between 2013 and 2020. It also predicts that refugees will boost Europe’s labour force by 0.4 percent by the end of 2016. However, this data remains ignored in the face of blatant political machinations. What happens if countries like Sweden and Germany stop taking in refugees and European countries start constructing unscalable boundaries, I ask the director general of the International Organisation of Migration (IOM), ambassador William Lacy Swing. IOM has been at the forefront of battling the migration crisis in Europe. “Clearly, it will make the situation much more difficult and we will have less and less place for these people travelling. We have to work with the media to get the migration narrative back to a historically more accurate narrative that migration, generally speaking, throughout history has been very positive; and get away from the very toxic narrative that migrants are coming for reasons other than good motives,” the former American diplomat says. IOM is working with governments to relocate 1,60,000 most vulnerable refugees as per a decision of the EU of conferring compulsory quotas for countries. So far only 1,000 have been relocated with most reneging on their commitments. The US has agreed to take only 10,000 refugees next year. However, after the Paris attacks 30 US governors had spoken vehemently against the Syrian resettlement programmes. The Obama administration has treated the refugee crisis as if it was Angela Merkel’s puzzle to solve. “This is something that the EU – both the European Commission and the European Council – needs to be trying to do more to make these countries accept their quotas. That’s a real challenge… Right now, the closing of borders has complicated a lot things for everybody,” Swing says. A recent article in the New York Times by Scott Slovic and Paul Slovic (‘The Arithmetic of Compassion’, December 4) brilliantly argues that our sympathy for suffering and loss declines precipitously when faced with increasing numbers of victims due to something called “psychic numbing” and “pseudoinefficacy”. So the image of a single dead child called Aylan Kurdi lying face down on a beach has a huge impact on us while 14 Syrian children drowning in the Aegean Sea the next day barely even registers in our consciousness. It is only when we meet the Rezas, Ahmads and Mohsins that we realise the enormity of what is unfolding in the world – a sample of what is happening to millions of innocent lives being crushed, mutilated and cruelly disentangled from all that is familiar through wars for narrow geopolitical supremacy. “Europeans have been through the euro crisis. They handled it. Europeans have been through the Greek crisis. Greece is still in the Union. Greece is now shouldering the heaviest load on the refugee side. If they handled those two issues, then why not be optimistic that they will handle the migrant crisis?” Swing says. “I have several hopes and dreams for Europe now,” he adds with a twinkle in his eye.